DR Congo, who won the inaugural CHAN tournament in 2009, dominated the match in Butare, Rwanda, with Guy Lusadisu putting them ahead after 44 minutes. After the break, the Leopards carried on where they had left off with Heritier Luvumbu heading in to make it 2-0 on 46 minutes, and Meschack Elia added a third nine minutes later. It means the Walias of Ethiopia are still looking for their first point in the history of the competition. They lost all three of their group matches in their first appearance at a CHAN finals in South Africa two years ago. DR Congo, coached by Florent Ibenge (pictured), have qualified for every edition of the competition which is specifically for locally based footballers who play in their domestic leagues. In the second Group B game on Sunday, Cameroon held on to beat Angola 1-0, despite having a man sent off midway through the second half. Cameroon took the lead after 23 minutes when Yazid Atouba scored from a well-struck free-kick. 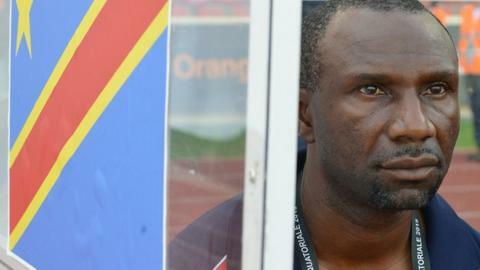 As Angola pushed to draw level, the pressure told, and Cameroon had Joseph Ngwem sent off with 20 minutes remaining after he received a second yellow card. Despite being a man down, Cameroon held on to secure the win. On Saturday, hosts Rwanda opened with a 1-0 win over Ivory Coast.